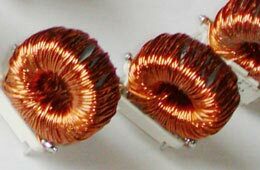 Inductors and transformers benefits from the functions that toroid provide. When it comes to picking a magnetic core, there are various options, and each option comes with its own unique pros and cons. Out of all the options, the most commonly used core is a toroid. There are several reasons why toroid are so ubiquitously used. The closed loo core of a toroid allows it to have the highest magnetic field of any other core type. A toroid is known for its high Q factor and its high inductance. Inductors that have straight cores can never achieve those high levels. A toroid is able to maintain magnetic fields within the core, which leads to low levels of leakage. A toroid is compact and lightweight. Adding toroids to devices does not add significant weight nor does it require special construction to house it. A toroid can fit into most preexisting designs. A toroid coil is symmetrical. The symmetry prevents magnetic flux, which can have detrimental effects to surrounding electronics components. You can find toroids used in restricting and eliminating electro-magnetic interference (EMI). Toroids offer their users many benefits. Above are just a few of the boons that toroids offer. If you need more information, reach out today.